Pinjore Garden is also known as Pinore or Yadavindra Gardens. 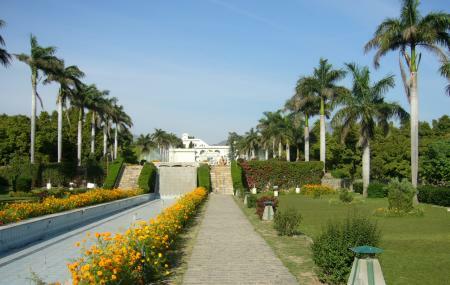 It is located in the Panchkula District of Haryana and is a Mughal Style Garden built by the ancient Patiala Dynasty. The name Yadavindra Garden is given as a symbol of honour to Maharaja Yadavindra Singh of the Patiala Dynasty, the former royals of Chandigarh. The garden has been laid down comprising of seven broad terraces. The main gateway opens on the highest terrace and there you can see a Rajasthan Style Haweli called the ‘Shish Mahal’ or the ‘palace of glass’ and beside it is the ‘Hawa Mahal’ or the airy palace. The second terrace has beautiful arches and leads to the Rang Mahal or the Painted Palace. The third step or terrace has dense growth of cypress and fruit groves and also beautiful flower beds. The next terrace has the Jal mahal and a square fountain as the name suggests. This is also a lovely spot where you can relax. The next terrace is full of picturesque groves and the lowermost terrace is where an open theatre is set up. It has a disc like structure. There is also a small zoo here. The Baisakhi and the Mango Festivals are very famous here and hundreds of tourists come here during these festive times to enjoy. Photography is not charged in here. Entry is free for children below 3 years. The nearest airport is the Chandigarh Air force based Airport. The nearest railway station is the Chandigarh Junction Railway Station. Love this? Explore the entire list of places to visit in Chandigarh before you plan your trip. Fancy a good night's sleep after a tiring day? Check out where to stay in Chandigarh and book an accommodation of your choice. How popular is Pinjore Gardens? People normally club together Cactus Garden and Gilbert Trail while planning their visit to Pinjore Gardens. Great place for a family outing. Just adjoining the garden there are options for fun games and car racing etc. also. I liked the garden a lot because of land scape and variety of flowers and plants. Beat time to visit is spring season. Not very far from Chandigarh so one can stay in Chandigarh and go for one day picnic.